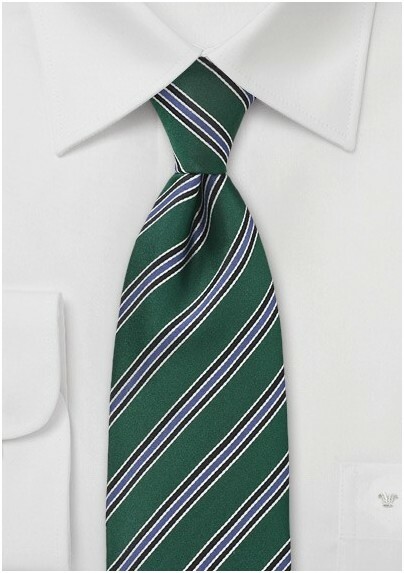 Go tailored to the nines with this remarkably modern and refined neck tie in dark green with black and blue stripes. The dramatic and graphic pattern of stripes has the magic to pull together an entire ensemble and make it look like high fashion. 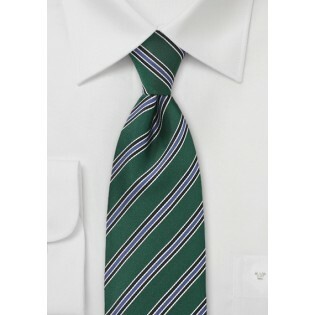 This essential accessory is a must have component for every man who owns a suit, sports coat or blazer. One of fave looks this season is seeing this tie paired with a tattersall pattered button up shirt, broken in black chinos and black wingtip dress shoes. Crafted from a beautiful and premium silk.